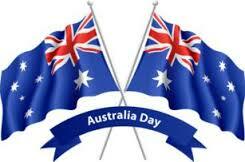 THE local Australia Day observance in New Norfolk will be held on the Derwent Esplanade this Thursday, January 26. The day kicks off at 10am when the annual fun run and walk gets under way. Entries will be accepted until 9.30am. The rest of the program includes music by the Derwent Valley Concert Band and Derwent Valley Community Choir and long-established local group The Sign, as well as the flag raising, announcements of Australia Day award recipients and an Australia Day address by the Australia Day Ambassador, Dana Faletic. The New Norfolk Lions Club will host a free Australia Day barbecue and there will be children's activities including sack races, gumboot throwing, paddle board demonstrations and more. There will be other activities in New Norfolk as well as Bushy Park and Maydena. Fun and Games with D’FAT, Derwent Valley PCYC, Derwent Valley Salvation Army, MoCo Dragon Boat Club, Community2Sea, Derwent Valley SES, New Norfolk Fire Brigade, and Laughter Lines Face Painting: Sack races, gumboot throwing, tug of war, dunk tank, zorb balls, sumo suits, dragon boat and other watercrafts displays, jumping castle and face painting. Free barbecue lunch and activities at the old Maydena Primary School around noon.